You know those days when you just want something sweet, and you have nothing in your house? I hope this is the remedy to that problem for you. I was craving my alternative to rice krispies treats — Crispy Kamut & Chocolate Squares, but now that I’m eating gluten-free I wanted to use a gluten-free grain. 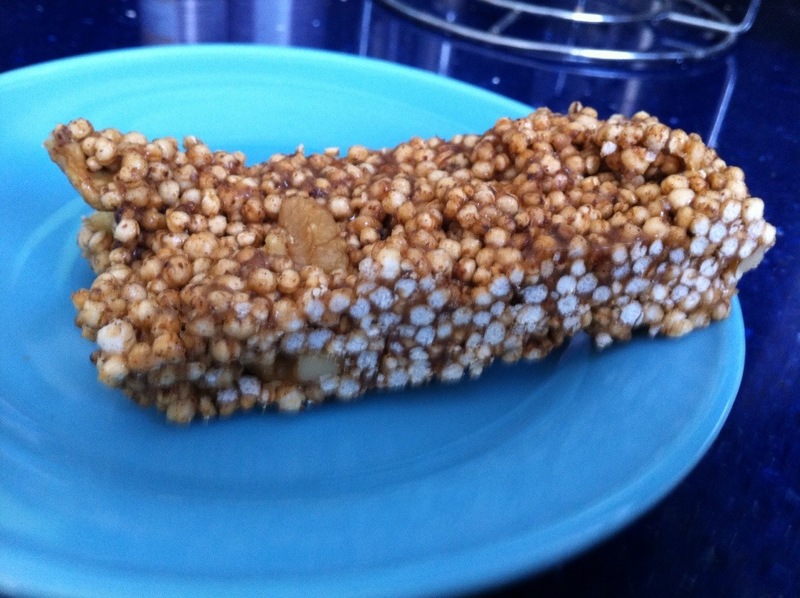 So off to my cupboard I went looking for puffed brown rice — and I found a bag of puffed quinoa sitting there just waiting for me! Perfect — a little more protein in my sweet treat makes me happy! A note about the sweetener here: I used agave nectar sent to me by the “Sweetness Ambassadors” at Redpath Sugar as an “Act of Sweetness” — they found my blog and sent me a bottle of their new product — agave nectar. Agave nectar comes from the agave plant (looks like a cactus, but isn’t a cactus), which also makes tequila! 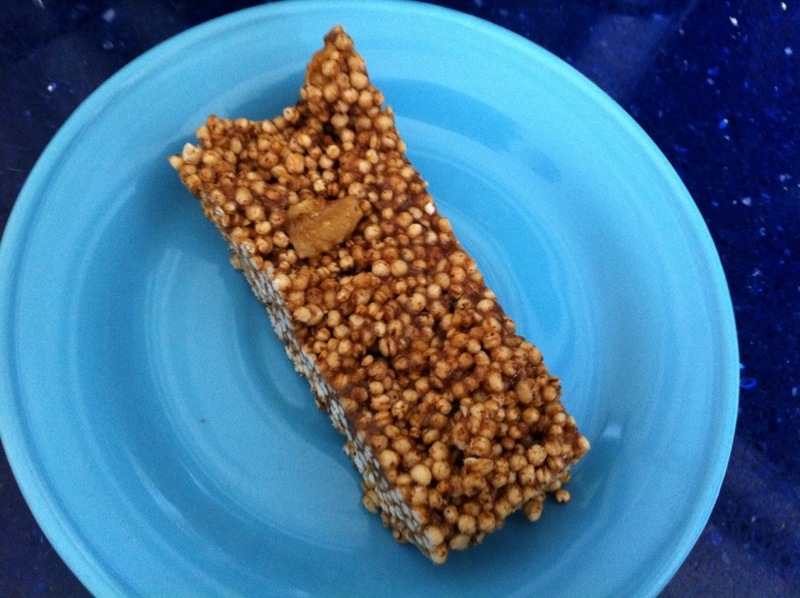 Agave nectar is a refined sweetener, and as such I use it as a treat food in my kitchen. I tend towards maple syrup as the sweetener in my baking, but this agave tasted great and has a more neutral flavour than the maple syrup or coconut nectar have. These are super easy to make, and were well-received by my friends who stopped by for coffee and got one of these on their saucer. In fact, I think I need another batch for this afternoon. Line an 8×8″ (20 x 20cm) baking dish with parchment paper. In a medium pot over low heat, combine nut butter, agave, vanilla, and coconut oil. Stir until everything is melted and incorporated into a smooth mixture. 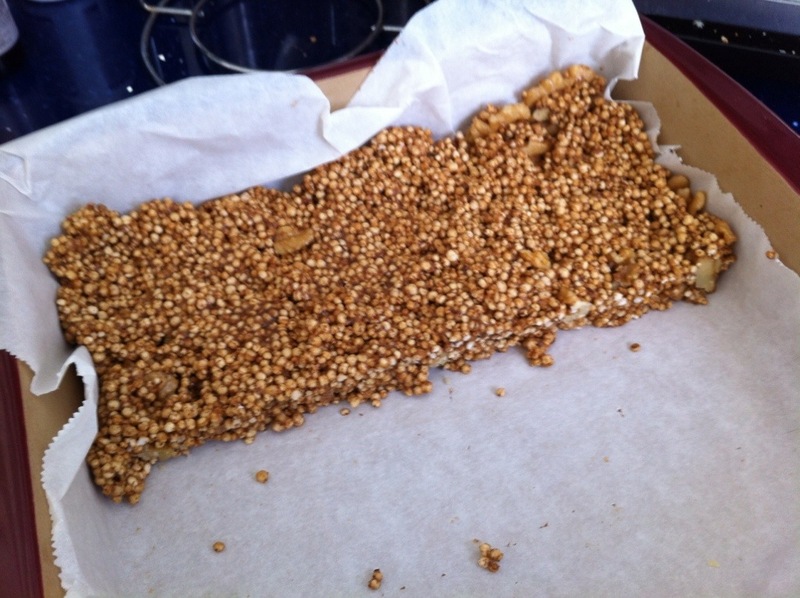 Pour the mixture into a large mixing bowl, and add in remaining ingredients (puffed quinoa, flax seeds, salt and nuts). Stir with a spatula or wooden sppon to combine all ingredients. Pour it all into the prepared baking dish, and press it into the sides with your fingers. Make the surface as even as you can. Pop the baking dish into the fridge for a minimum of 30 minutes. Cut into squares or rectangles and enjoy! Yum. I’m going to try these with raw honey. I think they’d be AWESOME with raw honey, Kei!!! Let me know how they turn out!